A modern take on Barbour's motorcycling heritage, the Chain International Baffle is from the bold Black & Yellow collection. This slim-fitting men's quilted jacket emulates the styling of archive racer jackets with its cropped length, stand collar and zip-through front. 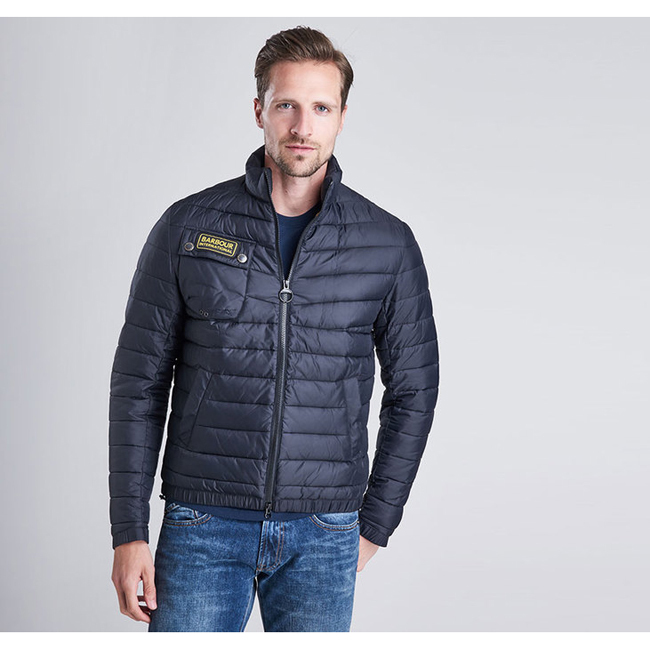 Its quilted outer is crafted in neat 5cm baffles with a unique 'chevron' design to the upper body, and filled with a microfibre down that promises superb warmth with a lightweight feel. Two lower pockets are generously proportioned for keeping hands warm and essentials safe, while a single chest pocket is angled in tribute to the biker's 'map pocket', originally seen on the International jackets of the 1950s.